Bangalore-based online trip advisor mygola has raised $1 million in seed funding, led by venture capitalist Dave McLure (also the founding General Partner at Internet seed fund and start-up accelerator programme 500 Startups). Blumberg Capital, as well as some angel investors (Lewis Cheng, Mac Harman, Sandeep Bapna, Priyavrat Bhartia, Aldo Monteforte and Alvaro Gutierrez), also took part in the round. The company has announced the fundraising in an official blog post. Dave McClure had first shared his investment in mygola with Techcircle.in. Anshuman Bapna, co-founder of mygola, told Techcircle.in, "We plan to use the funds to build upon the product and rapidly increase the number of our global guides who help people with their travel-related queries." Founded in 2009 by ex-IITians Anshuman Bapna and Prateek Sharma, mygola follows a question-and-answer model for information-sharing and working out travel arrangements. As claimed by the company, it has more than 50,000 registered travel enthusiasts. A registered user is guided through a set of basic questions for a fair comprehension on what he/she wants in a proposed trip and one of the mygola guides does all research and bookings for the trip. Therefore, it is as good as talking to a travel agent face to face and letting him/her customise a trip, based on one's specific requirements. 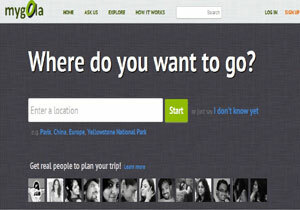 Incidentally, Mygola follows a crowd-sourcing model to recruit guides. Currently, the company has 1000 on board, with 80 new people being added every week. The business model is certainly innovative, compared to other vanilla OTAs who are banking on booking volumes to beat thin margins and acquiring not-so-loyal consumers looking at the cheapest pricing. Other travel advisory portals like TripAdvisor try to gel customer reviews and provide complimentary information regarding booking with help from its partner OTAs. But on the flipside, if the site is targeting people who want to do their own things instead of going to pushy travel agents, isn't one already getting such advice on TripAdvisor or VirtualTourist? Eventually, customer traction would decide it.